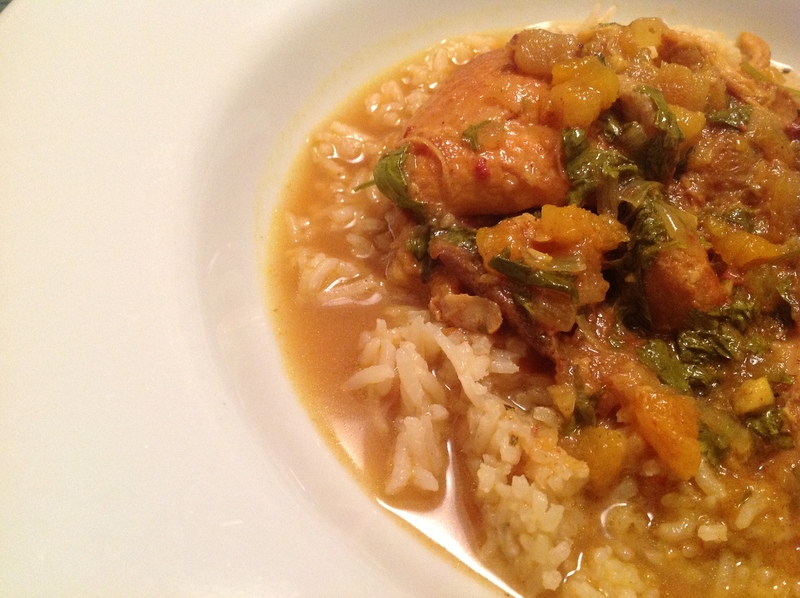 Korma describes a curry dish, often with dried fruit and nuts, that’s braised. I wouldn’t describe this dish as a curry through. The sauce is brothy and light. The flavors are reminiscent of curry, but unique to this dish. I can’t necessarily compare it to anything else, and based on my research, ‘korma’ is the most apt descriptor. This dish actually came from my mom – and it’s a low fat dish. I’m not kidding. And it’s amazing. And everyone loves it. I know you may be skeptical about some these ingredients, like the amount of lemon juice, but make sure to try it as written before tweaking it. I know that’s against my standard advice, but I’m serious. The other bonus is that you can serve this with rice (how I like it), quinoa, or couscous. This dish has become a family favorite. In fact, I would request it when I came home to visit during college. It has been tweaked over the years; we discovered that it’s best with chicken thighs. Mom originally used a whole cut-up chicken, but it doesn’t cook at the same rate and we all fought over the thighs. They’re amazing – tender, juicy, and packed with flavor. The other great thing about them is the longer this dish simmers, the better the chicken gets. That just wouldn’t be possible with white meat. In a large sauté pan over medium high heat, sear the chicken thighs until golden and remove to a plate. You’re just looking for color, not for it cook it through. Turn the heat down to medium. Add the onion and garlic, and let sauté until the onions are translucent. Add spices and ginger, and stir until fragrant. Add the dates, apricots, and chicken stock, and bring the stock up to a simmer. Return the browned chicken to the pan, reduce heat to low, and simmer slowly for 40 minutes. Just before serving, add the lemon juice and chopped cilantro. Serve over rice or couscous.